I just completed this tutorial and it was great. All my code has been typed in correctly I’m assuming because I don’t have any errors in Visual Studio. But when I run my program, my text boxes are blank and I can’t actually play the game. Please help! Which text boxes are blank, the player’s hit points, experience points, gold, etc.? Or is it the message box? Do you see the direction buttons, and can you click on them to move? If you answer those questions for me, and can upload a copy of SuperAdventure.Designer.cs (make sure it’s the Designer.cs file) to GitHub, or Dropbox, so I can look at it? i finished all of the tutorials and i have no errors but my program wont run. it says that there is something wrong with the MoveTo(_player.CurrentLocation.LocationToNorth); something about null. If you don’t find any differences, can you copy the complete error message here, or upload a screenshot of it somewhere? There are a few different places we might need to check. Hi, I’ve correctly entered my code, but the window does not change when I click the north button. If you are missing any of those lines, you might not have double-clicked on the buttons, when creating the functions. *.Designer.cs files hold the code for the controls on the form. These lines connect the buttons to the functions in SuperAdventure.cs. When you double-click on a button, in the Designer mode, it will create these line in SuperADventure.Designer.cs file, and the empty function in SuperAdventure.cs. If any of those lines are missing, you can paste them into SuperAdventure.Designer.cs. Look for the other lines for that button (with the Location, Name, Size, etc. properties) and paste the missing line there. If that is not the problem, or that does not fix the program, can you upload your solution to GitHub, Dropbox, or some other place where I can look at it? Did you see any differences in the World class? I think that is the most likely source of the problem. If you compare the files, and they are the same, can you upload your solution (all the files)? I didn’t seen an obvious problem with that file. Can you tell me which text boxes are blank, the player’s hit points, experience points, gold, etc.? Or is it the message box? Do you see the direction buttons, and can you click on them to move? After you give me those answers, we can figure out the next place to look for the problem. Hello Scott, here is a copy of my rpg’s designer file, maybe you can help me this way. OK. I don’t see the eventhandler lines I listed in my last answer. That will connect the button’s “Click” event to the btnUseWeapon_Click function in the code-behind file. Then, you need to add the other lines I listed, for the other buttons. Try making those changes and see if that fixes the problem. Actually all of my text boxes are blank. All my buttons are showing but they don’t do anything when I click on them. Also, my list boxes are empty. Here is the link to drop box with all of my files in it. Thanks for your help! Dropbox didn’t have all the files, and some of them looked like they weren’t in the correct location. I cleaned up the solution, as best as I could, and re-uploaded it to: https://www.dropbox.com/sh/8ol541650t2cdam/AAA9MnTGfLC3jJ190EouVZTNa?dl=0. If you download it into a clean directory, and use its solution file, that might fix some problems for you. 1. The MonsterByID function was named MonsterbyID. 2. The LocationByID function was named LocationbyID. Those could have been causing a problem, because C# is case-sensitive. When you use a class, function, variable, property, etc., the upper and lower-case need to exactly match between where they were created and where they are used. I made the change in the new version of the solution I uploaded for you, so you do not need to fix those two things. with the MoveTo(_player.CurrentLocation.LocationToNorth); part highlighted. Did you check the World class, to see if there are any differences? Your World class is not declared as a static class. That’s probably why you get a “null reference” error. Look at line 9, of this code: Lesson 11.1, to see what it should be. Let me know if you fix that and there is still a problem. Check the World class, and ensure the class, and LocationByID function, are “public static” (especially line 9, where the class needs to be declared static). It’s all public static (in Line 9 and 214) As i checked the error again today, Several People on the internet say that it may be caused by a “null” reference, so mayber there is a problem with the if-statement of location by ID. If its wrong, the method returns null. If you don’t find a way to fix it, can you upload your solution to Dropbox or GitHub, so I can help? I’m sorry if you already answered this to someone else, I just can’t find it. So everything looks great I even copy pasted everything so I can be sure the code is ok, but when I click start it shows the message “There were build errors. Would you like to continue and run the last successful build?” and I can’t find the solution. Can you upload your solution (all the files, including the ones in the sub-directories) to Dropbox or GitHub, so I can look at it? Almost everything in my code is the same of your, I wish to make a way of call the Battle system in my principal code everytime when a Battle happens in the game but as I just started the College I’m having a hard time on it, if you help me I really will be greatful. OBS: Sorry about my english. I’m not from US. Hello. Have you seen lesson 23.1? In that lesson, I show a console front-end for the game. It will be different from your code, because there will be new features added. However, it might give you an idea. If that does not help, please tell me. Then we could try something more. Hi Scott, thanks for answering. My only problem is to make as you have done…make a variable called “currentWeapon” to hold the current weapon that the player is using, and at the battle system use this “currentWeapon” minumum and maximum damage to set a value of the damage I’ll increase to the monster. I try do everything a can, but, as I say to you I have just started working with C# at College, and my knowleges aren’t enough to help me. but again a error came at “Details” It doesn’t exist anywhere…I jumped a few classes cause I don’t want to make a complex game so I don’t know if you talk about it, i’m traing to make a simple game …is just text and more texts and them the player finds a creature and fight against it with his diffent weapons with diffent damages that have in the “World Class”. Please Help me, it’s just use a “currentWeapon” to hold the current weapon that the player has in his inventary using the weapon damage to use at the battle system. I will really apreciate your help. Can you upload your solution files (including the files in the sub-directories) to Dropbox or GitHub? I can look at it Monday or Tuesday. It sounds like there are a couple extra event handlers in your code. If you accidentally double-clicked on some of the controls. while in the UI Design mode, that could have created them. 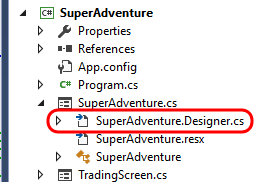 To get rid of them, double-click on the SuperAdventure.Designer.cs file in the Solution Explorer (you might need to click the triangle on the left of SuperAdventure.cs. to see the Designer file). Then search (you can use Ctrl-F, to search in the file) for the lines with “dgvInventory_CellContentClick” and “SuperAdventure_Load”. You can delete those lines, or put two forward slashes in front of them //, to comment them out. Please tell me if that does not fix the errors. Yes! I commented those two lines out, was afraid to do that earlier, thanks! It’s compiling and so far (not tested much) working. Thank you, sir, very good tutorial. The problem is that the inventoryItem.Details.Name returns null. Same with inventoryItem.Details.ID. So either I’m missing a new somewhere that I can’t find or I just need to add one in. Also I love your tutorial. I’ve learned so much more from this than the C# class I’m taking. Plus I love it! Thanks John! I’m glad the tutorial is helping you. Can you paste the code for your Player.cs, Monster.cs, World.cs, and SuperAdventure.cs files someplace (maybe https://gist.github.com/)? The problem is probably in one of those files. Sure thing. Here’s the link LINK REMOVED FOR PRIVACY. Aaaaaannnd I just realized I forgot to initialize the Snakeskin item in my World.cs and that’s what was causing the problem. Thanks for the help on where to look and also on the speedy response! Cool! Finding the source of a bug is a major part of becoming a good programmer. Let me know if you encounter any other problems. Hey there, thanks for your tutorial, I’ve been enjoying it so far and I am leaving off with some final questions. First off, why do you think I am not given my Rusty Sword at the start of the game? Somehow, even though the program runs perfectly, it still doesn’t give me the sword and it disables me from even fighting. Secondly, you didn’t explain what was the function of “readonly” which I tried to find explanations and no one asked about it so I want to see if you can answer my question. For the rusty sword, I need to look at the code this weekend. Right now, I only have the final version of the SuperAdventure solution (after Lesson 24.1). I think one lesson moves the line that gives the rusty sword to the Player class, from the SuperAdventure class. I’ll reply again, after checking the version of the code for this lesson. “Readonly”, on a class variable, means it can only be initialized (set with the initial value) from inside the class constructor. Other functions in the class can “read” the value. but the constructor is the only function that can set the value. If the variable is a List varaiable, the constructor is still the only function that can set the initial value. But, other functions can Add or Remove values from the list. I’m going to check over the lessons, and add that to the lesson with the first readonly variable. I see, well I hope to get it done as soon as possible since school term is starting for me soon and I hope I can get this lesson done right before it starts so that I won’t have to catch up a lot after my break. In Lesson 19.4, we add the rusty sword to the Player’s inventory inside the Player.cs constructor. If you want, you can add that line back into the SuperAdventure.cs constructor. Or, you can continue up to Lesson 19.4 – although, if you go that far, I suggest you also do Lesson 19.5, to also handle when the player changes their selected weapon. Actually i’m hanging in this Lesson 16.3. I’m getting a “Error:(49, 21) CS0161: Player.cs(49,21): error CS0161: `Engine.Player.HasThisQuest(Engine.Quest)’: not all code paths return a value” by compiling. I think the “return false;” (on line 57) needs to be after the foreach’s closing curly-brace on line 58 – but before the function’s closing curly-brace on line 59. Please tell me if that does not fix the error. Great, that one works. Thank you.